1. Preheat the oven to 200ºC, gas mark 6. Heat the oil in a large frying pan and add the bacon. Cook for 2–3 minutes, stirring occasionally, until the bacon starts to brown. Transfer to a bowl using a slotted spoon. 2. Add the onion, garlic and mushrooms to the pan and cook for 3–4 minutes until golden, stirring occasionally. Add the thyme leaves and cook for another minute. Remove from the heat and set aside. 3. Cut the pastry into quarters and transfer to a baking sheet. Using the tip of a sharp knife, score a 1cm border around the edges of the pastry, taking care not to cut all the way through. 4. Spread the crème fraîche over the pastry, inside the border. 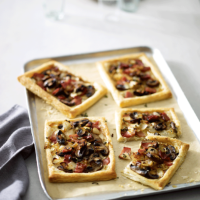 Top with the bacon and mushroom mixture and bake for 20–25 minutes until risen and golden. Serve with a crisp green salad. For a vegetarian version of these tartlets, replace the bacon with sliced red and yellow peppers. This recipe was first published in September 2015.